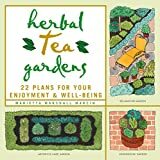 This tea lover's gardening bible contains full instructions for growing and brewing tea herbs, plus more than 100 recipes that make use of their healthful qualities. Readers will find complete plans for customized gardens suitable for plots or containers. Completely updated with new a format, 25 new herb profiles, and 100 new tea recipes, this edition provides both the novice and herbalist with a complete guide to growing and brewing 95 tea herbs. Two-color illustrations. This is one of the most informative books I have read on the subject of herb gardening. I found the book difficult to put down. It includes extensive descriptions of individual herbs from the most ordinary to the hard-to-find. One of the most enjoyable aspects of the book are the recipes for herbal tea blends and corresponding health benefits, which are listed thoughout the book. Also included are garden plans, propagation methods, and harvesting tips. I highly recommend this book as a reference guide for the beginner or the seasoned gardener.